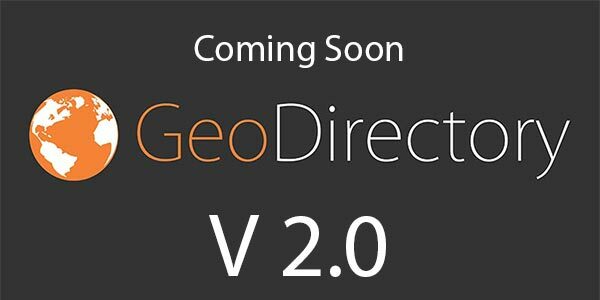 and this new GeoDirectory Dashboard will be integrated into the Core plugin, still completely free of charge. However we didn’t want the site admins to find a settings page when clicking the GeoDirectory main menu. Instead we wanted a sort of Admin control panel. A dashboard with the fundamental data needed to actually run the directory. A couple of weeks ago, I opened a thread asking what kind of data our members would like to see in their new GeoDirectory Dashboard. Surprisingly not many voiced their opinion, so we had to take all the decisions directly. I was surprise to see low participation, because I’m 100% positive that this will be the screen most Directory owners will look at 1st thing, when visiting their website dashboard every day. I know for a fact, because the screen that I look at the most on our website, is the Easy Digital Download report screen. This is basically a dashboard of our own figures, sales and revenues. Today, Yesterday, This Week, Last Week, This Month, Last Month, This Year, Last Year, Custom and Total. You will be able to filter by all CPT or filter by specific CPT. This are the latest drafts that our new UI guy came up with. could you add listing vue stat? Apolgoies for following up, but now that we have entered February, is there any update on the timing of the release? We started working on the new UI with the designer, we’ll announce when done. If you are not using prices and payments you won’t see that box. Just waiting for V2 to be released. Congratulations to your UI guy, it looks gorgeous! Regarding data on display, I’m wondering if it would be possible to disable some of them, especially (in my case) those regarding paid listings and revenues, since I’m not going to let users pay. the problem with showing page views is that either we count them directly and that would make GeoDirectory super heavy. This unless you have a very big server, because the application would have to write in the DB for every single pageview. That wouldn’t make sense and that’s why there are few 3rd party applications like Google Analytics that are globally used for this purposes. We could add in the dashboard few figures from Google Analitycs, but unless you connect GA with your website, you wouldn’t have the data available, adding complexity to the setup. In addition, Website Analytics are complex metrics that requires many screens, like Google analytics offers. That’s why we think it is not dashboards material. We are also removing the current Google Analytics tools from core and move it into a free add-on to make the core plugin lighter. This because the amount of files required by the Google Analytics APIs to draw graphs and so on is ludicrous. @Stiofan any chance that you could give any indication? @paulo yes i read it. hence why i have feedback. It appears to have quick links to the pending reviews and other items in dropdowns at the top. I would like to make sure we can approve them from there and not have to go to another page to do this as seems to be the trend in a lot of plugins. I dont want to leave the dashboard to do these daily tasks. perhaps if you showed the dropdown content then we could see what the purpose of the dropdowns is? The purpose of the dropdown is to provide a link to go to the WordPress page where you can approve posts, reviews and so on. That way you can actually read them and make sure they are legit. Building another interface (that already exists) to let you read post and reviews and approve them on the new dashboard, makes no business sense to us (would take months). So providing an interface to approve in the dashboard, would mean approving something based on its title. What if the title is “Nice green park” but all the details are about a night club? I’m sorry to disappoint you but doesn’t sound like a good idea to us. Thanks or the update Paolo! Any chance you could indicate for which week in Feb the release is planned (fully understanding that it’s not a guarantee)? This would make it easier to plan, as I’m thinking to take holidays after the release to finalise my website with a developer! good stuff. I use the directory, but need to really get into it before offering intelligent feedback. Thanks for asking for our opinions. Looks good! Glad to see the backend ui going more wordpressy. To be honest i couldn’t care less about how many reviews “bobs restaurant in dallas” has. You state in the artice “Surprisingly not many voiced their opinion” and i think there is a reason for this. I am only new here and what i gather is the main fundamentals e.g being able to customise the parts of wpgeo are more important than a fancy dashboard than 95% would not even use or even care about. How many times do you look and go ooo I have 450 blog posts etc etc. Every Directory looks the same as the layout is hard to work with, if you concentrated on this you would be on to massive winner, coupled with linking other custom post types. Looking forward to the new dashboard. If possible, a core “business hours” plugin would be appreciated. As you know the third party plugin is no longer being supported. That’s already been confirmed, V2 will include a business hours module into the free plugin. I like what I’m seeing. And totally agree, that I like to see a dashboard instead of any settings page. Yes I like the idea as this is moving with the times. This looks fantastic – big step forward, looking forward to V2! I received this in my email, but never received an email asking for my opinion on what I would like to see. However, I do like what you have come up with. We don’t send emails to ask for opinions, if you want to participate to this kind of discussions, you should spend more time in the forum. Sorry I didn’t see the initial thread but my opinion is that this dashboard will add a lot of value to someone running a real directory! Can’t wait to see it. Let me know if you want a beta tester. For the dashboard I would probably also like a opportunity to see quick access dropdown for things like review approvals or listings so i can approve directly from there quickly and easily without having to visit other screens. If you look closely at the top of the screenshot you’ll see “actions required”. I also mentioned that in the post, did you read it at all? Category break down to give insight into thin categories. Also nice would be: Expiring soon listings and a New listings list, Recently Renewed. Thanks for the feedback, for pageviews we definitely think they don’t belong here, but in a Google Analytics account. The latter should be WPI reports and we will look into implementing them too. For a business directory owner, it is so important to tell business linsting owners, what good does that directory do to them. So, since we don’t do bookings so we could tell them “we brought you 15 clients this month” , I think there is another metric that could help us. ‘Phone number clicks’ – each listing has a phone number attached for appointments/reservations/info etc. It would be great if we could have a report that shows us how many times which number was clicked for all the listings. Thank you for the stellar work. Any chance you could include the views as well. 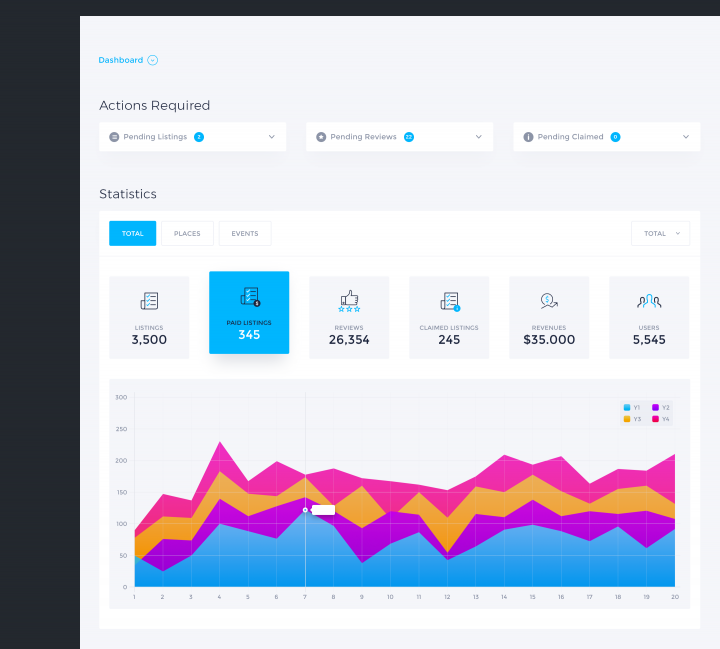 In other words integrate the dashboard with analytics to see most watched listings, etc. Excellent! Keep the good job!